Bad bedding will be the first thing preventing you from getting a solid night’s sleep. First consider your layers – it’s worth having both a duvet for the cold nights and a blanket/sheet for the summer. Have these on your bed at all times. This will give the option to easily switch between them in the night if the temperature gets too hot or cold. You can also consider extra layers to add comfort such as a foam layer over the mattress or extra thermal layers for when it’s really cold. You should then consider the material of your mattress and pillows. A mattress isn’t something that should be skimped on – it could be worth upgrading to memory foam if you’re constantly tossing and turning. Some people meanwhile may prefer a more solid mattress, especially with joint problems where an orthopaedic mattress may be able to help alleviate pain. Feather pillows and duvets (for those that aren’t allergic to feathers) can meanwhile add a fluffier feel to your bedding. Like mattresses quality matters here too – buy a cheap feather pillow and you’ll have feathers poking through, whilst a more premium pillow won’t have this problem. A cold wooden floor will discourage you from getting up in the morning. Keep your feet warm by either buying some cosy slippers or purchasing a plush rug to sink your toes into. Shaggy sheepskin rugs can be great to have by the side of the bed and could be an easier to clean and cheaper solution than installing a full carpet. Make sure that the rug is the right size and that it doesn’t look out of place with the rest of the décor – a mismatched rug will only bring disharmony to the room. Bright sunlight can ruin those rare mornings when you can get a lie in. Block out the sun entirely with some black out blinds or roller shutters. There are lots of blind and roller shutter options to choose from to match any décor scheme whether you’re looking for a rustic Venetian style to suit an old house or a panel glides for a more modern touch. Sunscreen blinds meanwhile can allow you to still look out of your window whilst blocking the glare. Some people may prefer curtains over blinds. 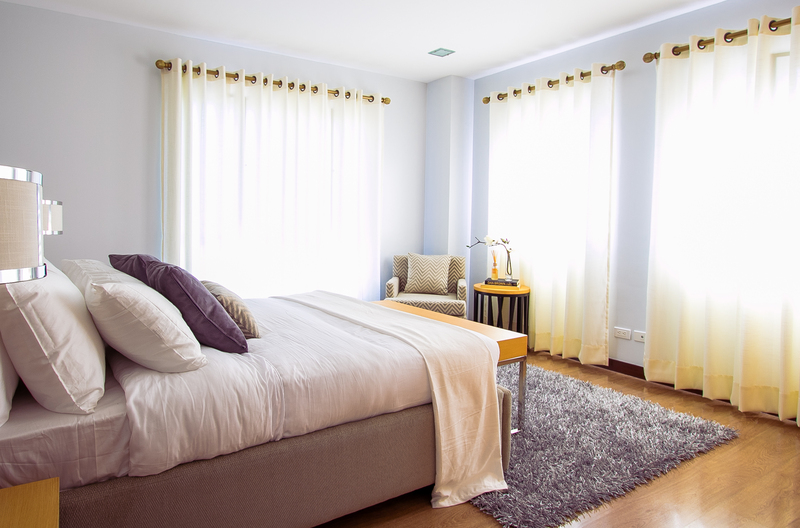 Thick curtains can be great for also providing insulation in winter, however should be ideally swapped out for lighter sash curtains in the summer. You can also use curtains in combination with blinds to provide a full barrier against the sun’s heat and glare. Warm colours such as reds, yellows and tan colours can be great for areas such as the living room and kitchen in which you may want to socialise or be active. However they may be too stimulating in a bedroom, preventing you from getting as much sleep by making you feel energised. Cool colours such as greens, blues, greys and pastille browns may be more suited in a bedroom emphasising a more serene mood. For a touch of liveliness, purple can be a good choice as it’s still cool enough to help you sleep. Consider these hues when both painting the walls and choosing furniture. Washed wood is a great furniture choice for a bedroom as it gives off a relaxing beach hut feel. You can find plenty of wardrobes, bedside cabinets, chests of drawers and bed frames made of washed wood. Oak and pine are the two most popular washed wood materials. Greys and whites compliment this texture well. You can even consider painting washed wood furniture if you have another colour scheme in mind. Floral and starry wallpaper designs can be great in a bedroom, creating a dreamy backdrop as you go to sleep. You should aim for subtle patterns that bring a sense of harmony to the room. Patterned wallpaper can also be complemented with similarly patterned pillowcases or a matching rug. If you don’t want to wallpaper over the whole room, you could just choose to have a single feature wall. This can work well on the wall above the head end of the bed, creating an inviting feel for when you’re getting into bed. Plants can be a pretty feature to add to a bedroom, connecting you with your natural side. Plants also provide a rich source of oxygen which can have psychological benefits, helping you to sleep better. On top of this, plants are great for absorbing toxins in the air and soaking up moisture, preventing illness and acting as a natural dehumidifier. Spider plants, peace lilies and aloe vera are just some of the great plants to incorporate into your bedroom to help you sleep better. Bamboo palm and jasmine meanwhile can bring an exotic feel to your bedroom that is good for complementing washed wood. Make sure that plants are positioned in places that receive enough light during the day – some tropical plants may require less light and be more ideal for pokier bedrooms with smaller windows. Clutter isn’t good for the mind and having it in your bedroom can make you restless. The tops of dressers and bedside cabinets can often get cluttered with cosmetics, toiletries and books. Consider new ways of neatly storing these away. This may require buying a make-up box or a bag for storing toiletries. There are lots of creative solutions that can give you more space for hiding bedroom possessions. Beds with storage compartments underneath can help to hide clutter more efficiently. You can also buy footstalls with storage space inside. Avid hoarders may prefer to tackle their clutter problem altogether by chucking out possessions and buying furniture that forces you to store less items. Buying a small make-up box may limit how much make-up you can have. A smaller wardrobe meanwhile may encourage you to keep less clothes. Some people have even gone to the extreme of getting rid of their wardrobe in exchange for a clothes rail. By having all clothes on display and no cubby holes for hiding extra clothes, it could encourage you to throw away those old dresses and jeans once and for all. A mirror facing the bed is bad Feng Shui – it depletes your personal energy as you sleep. Spirituality aside, a mirror opposite your bed can be bad for the simple fact that it will be the first thing you wake up to. None of us want to see our reflection as we wake up – move your mirror elsewhere so that you have to make an active effort to get out of bed and go over to it in order to see yourself in the morning. If you’ve got a stand up mirror this can simply be put in the corner of the room or turned around whilst you sleep. For wall hanging mirrors, consider putting them hanging on the side wall rather than opposite your bed. A mirror opposite a window can help to let in light, which may be good for a dark and poky bedroom but not so good if you’re trying to limit light coming in. Some people may have mirrored furniture such as mirrored wardrobes. These aren’t great if they’re facing your bed. A better option may be to put a mirror on the inside of a wardrobe door. It will then be hidden out of sight when the wardrobe door is closed. The option of waking up to a warm brew without having to leave bed might help motivate you for the day. This could include a kettle or percolator on the bedside cabinet. You’ll then have the luxury of a hotel room in your bedroom. For those that like milk with their tea or coffee, it could even be worth putting a mini-fridge in the room. This can be used not just for storing milk but cold water, juice or even a beer for the evenings. Guilty midnight snackers may want to avoid this piece of kit though – easy access to food in the night could prevent you from sleeping well. Next Post Making A Home More You!